A powerfully reliable, yet affordable, small form factor (SFF) workstation, the E32 is perfect for 2D and entry-level 3D creators, as it’s certified to run numerous professional independent software vendor (ISV) applications. Tower workstations provide the ultimate performance with full-featured scalability, weigh about 12.5 kgs. The E32 workstation features a 15-month life cycle with no planned hardware changes that affect the preloaded software image. Image stability for long-term deployments helps to reduce transition, qualification, and testing costs to ensure savings for your business. ThinkStation E32 is certified to run many key professional independent software vendor (ISV) applications, including Adobe, Dassault, PTC, SolidWorks, Avid, and Siemens. Additionally, E32 includes error correcting code (ECC) memory, which drastically reduces the possibility of memory-related errors and critical data loss. Perhaps what's most beneficial about the E32, however, is that it includes a preloaded 60-day trial* of Autodesk® AutoCAD® LT design software to aid professionals in creating 2D and basic 3D modeling. *Autodesk AutoCAD LT 60-day trial only available on English language version of ThinkStation E32. Maximize productivity with independent display support for up to three independent monitors using Mosaic Mode with Intel® graphics. Plus, connect to up to 16 independent monitors with 1.2 stream cloning mode. With 6 USB 3.0 ports (two in the front and four in the rear), plus 3 USB 2.0 (one internal), you can move data quickly between your workstation and other devices. SuperSpeed USB 3.0 enables file transfer up to 10 times faster than previous USB technologies, which allows for lightning-fast copying of large media files, as well as seamless connections between audio- and video-related devices. Backward-compatible with USB 2.0 devices. Upgrades are a cinch for IT staff, with convenient tool-free access to hardware. Especially beneficial when working with multiple workstations. And the E32 SFF supports up to three hard drives ( 3.5" SATA (6Gbps) 7200 rpm, 2.5" SATA (6Gbps) 10K rpm, and 2.5" SSD (6Gbps). 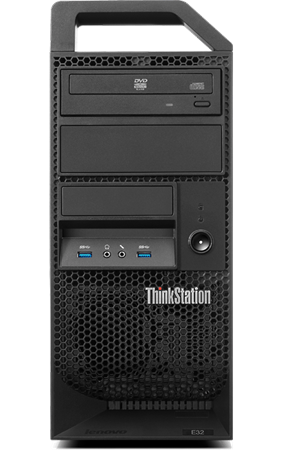 ThinkStation E32 workstations include some of the best security tools available in the industry, including USB ports disablement to help prevent data theft and network security risks against unauthorized use of storage devices. The Trusted Platform Module (TPM) encrypts data and key information like passwords and digital certificates, further securing applications, electronic transactions, and online communication. A Kensington lock slot makes it easy to physically secure your workstation. Plus, Intel® vPro™ technology provides one-touch setup that allows deployment and configuration of the technology on up to two-thirds of your install base within minutes. 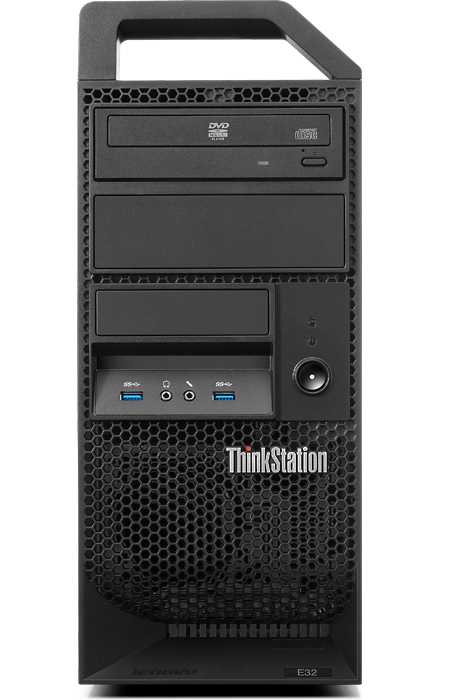 The ThinkStation E32 continues the long legacy of unmatched reliability touted by Lenovo single and dual processor workstations. It's built with the same efficient thermal design and employs a cooling process that makes ThinkStation workstations stand out from the competition.